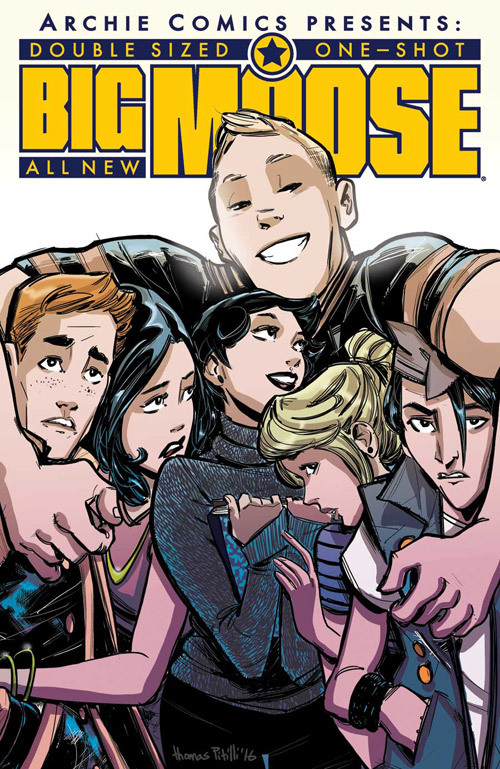 Archie Comics takes a risk dropping the One-Shot of Moose Mason. Okay, so not necessarily a risk but a way to test the waters to see how the character fairs. The book consists of three stories about Moose’s daily life and trials that a large football player experiences. His first story revolves around his dietary habits and the issues that can cause him. His interaction with Jughead is priceless. The second gives us a week in the life of Moose. He has to deal with a term paper, his girlfriend Midge, and the solid support that he receives from home and on the football field. Finally, we get what it would be like to be such a likable person as Moose. The artwork in the last story is more along the lines of the traditional Archie art style but it’s the story that gives us a more unique look at who Moose really can be. I enjoyed the artwork more so in the first two episodes. The comic shows some merit in Moose. He doesn’t simply play out the typical jock character.